Wenzel Alpine Tent – 3 Person Features. 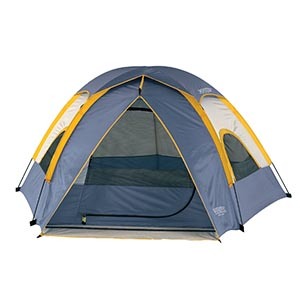 This tent product has many mentionable features some of them have already been introduced. Let us now move on to the detailed review of these features whether how these features can benefit you. What you need is a tent which should be strong enough to fit in the ground strongly and with this Wenzel Alpine Tent, all of such needs are fulfilled. 3-Pole tent will hold out just perfectly in the ground and will be able to withstand a little hard weather conditions. However, if the weather conditions get too extreme, this could be a thing to worry about. The tent in review is not something which would take hours to setup but in fact, due to its shock-corded fiber glass, you can easily fit it within the ground and it would only take few seconds. Even if you are along on your adventure, you can easily fit this tent in the ground alone and quick. Two Mesh Windows for Ventilation. If you can get proper ventilation in your tent, it will be best for your summer vacation adventure. Yes, you can get this feature as well with this Wenzel Alpine tent which has installed two mesh windows in it and it will just be perfect for the proper ventilation. 3 poles to fit in easily and hold out in different weather conditions. It is also quite economical. During summer vacations, it features proper mesh windows for ventilation. Extreme weather conditions would be bothering. Make sure that the group of people you are taking on camping doesn’t exceed the sum of 3 otherwise, we wouldn’t recommend you this product. However, with an average budget and group two or three persons, just go for it.